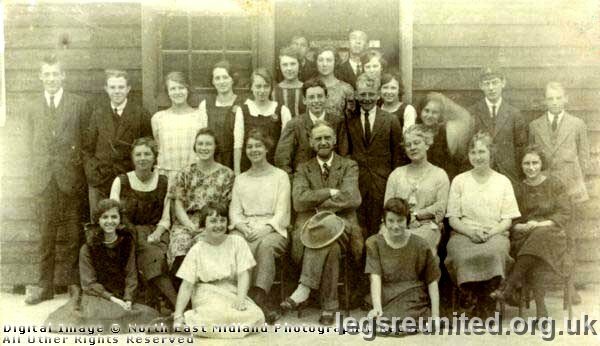 Long Eaton County Secondary School (Tamworth Road) teachers and school leavers. Headmaster Samuel Clegg (Died 1930 ) is seated centre. Others present, but not identified, are William Daykin, N Ironmonger, and Muriel Negus. Says Jocie Kemp: Jack Kemp born 07 May 1906 and started at school when 10 (he failed scholarship so parents paid). The hut was put up as a temporary building, but was there in the 50s!. If he left after matriculating aged 16 then this would be 1922. He taught boys who were just a little younger than he was. Jack Kemp is far left and next t him is Cecil Williamson.